What so ever! Pink was my first favorite color and I still love it :) Anything in pink makes me feel girly girly and soft. So a freaking pink rice can never be denied by me or any kids ;) isn't it? Wash, peel and cook the beets in microwave or pressure pan. Once cooked, grate and keep it aside. Wash and soak rice for half an hour. Pressure cook with two cups of water. Once done allow it to cool on a plate. Add a tsp of ghee to the rice and separate the grains. Take a pan and add a tsp of oil, drop in the curry leaves and saunf followed by chopped onions and split chillies. Fry till the onion turns golden brown. Now add the grated beets along with some salt and fry just for few mins. Now mix in the rice along with the vegetables thoroughly. You can add gharam masala powder or the spices(bay leaf,cloves and cinnamon) directly as well to give it additional flavoring. You can powder the saunf and add it to avoid kids removing it from the rice. I love anything with saunf, this is awesome recipe gal! Amazing carving... Lovely idea of decorating it like a vase! Hats off nithi!! 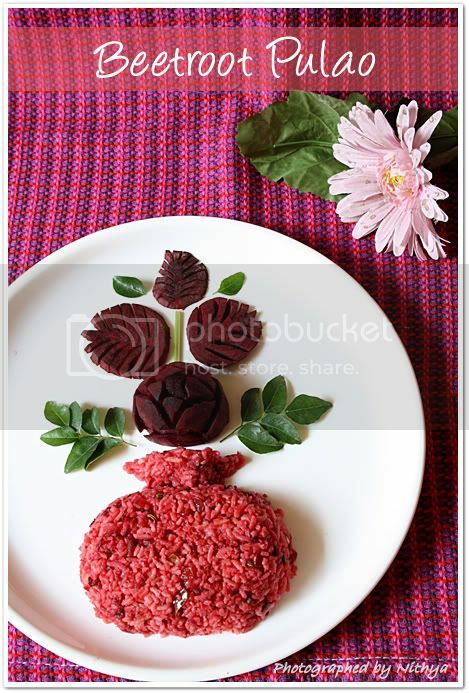 I love this version .. beet pulao is my lil ones all time fav but have nvr tried adding saunf to it .. Great clicks n presentation !!!! subtle flavor and awesome decoration !! Yummmyyyyyyy, wat a beautiful looking pulao, lovely presentation Nithya..
Wow! 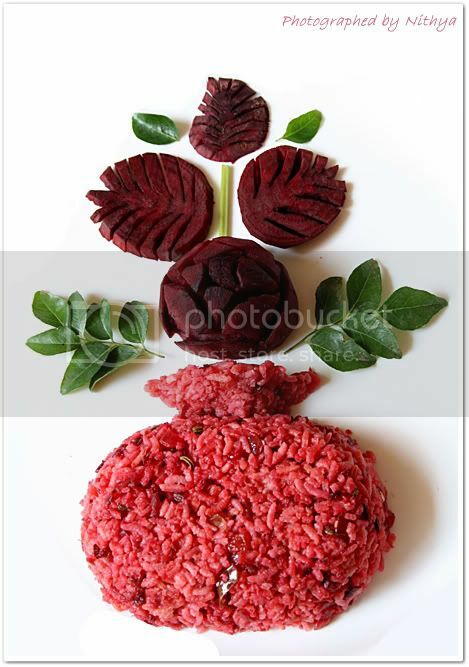 lovely presentation..I love anything with beetroot..rice is so delicious and tempting..
Beetroot pulao looks lovely. Love the beautiful red colour. Great clicks. 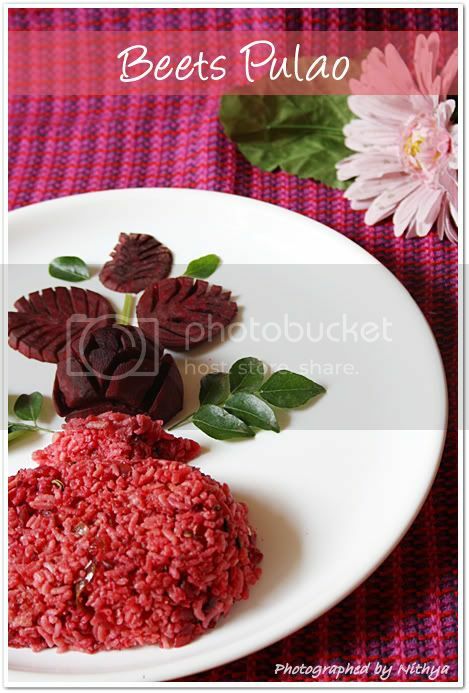 Beautiful rice and carving nithi. Yummy rice and anyone can get attracted to this color !!! Lovely. love it and love the presentation..
Beautiful color, i love Beet. Pulao looks delicious. Awesome recipe and pretty color..loving the color and the garnish. love beet...lots of flavor!!Yummy! !Nice Presentation!! Looks delicious, love the vase ! awesome recipe ! Lovely pics and carving! You are a very talented girl. The presentation is simply extraordinary. Hats off to your creativity! I stopped rice two months ago, however I assume this will end when I visit my parents next month. Pulao was once my favorite dish and is now my most favorite dish as I do not have it often. Beetroot pachadi is a dish my mother prepared for lunch and it tastes awsome. The entire rice turns red. 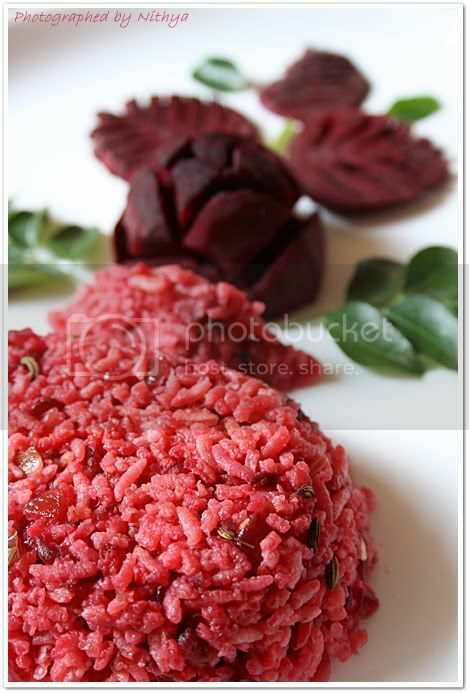 I love beetroot and like to mix it with rice and eat. But have never tried beetroot rice as such. 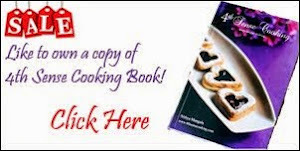 Congrats … u have won the giveaway at my blog. I have mailed u the details regarding it. Pl go thru it asap . Colorful pulao nits ,loved the carving too . Wow, this luks simple and delicious....of the presentation is really great. Great work. I just tried this recipe with a little bit of twist. Check out my blog. What is your inspiration behind such creativity, Nithya? I'm your fan! As like many various other greatwebsitebuilder.com/ songs applications,Here this application is also not offered on any of Install Music Paradise Pro APK on Android & Download on PC official app stores. So, to streamline Music Paradise Pro your initiatives to mount this application, we have actually given a really easy and also easy means to download and Music Paradise Pro Download install as well as install. This wonderful lean and clean application works with all Mobdro your Android gadgets. You could delight in free live TV shows,official guide flicks and also funnies on your gadget.Mobdro APK If your purpose is to enjoy online information, favorite sporting channels or any type of language material.